Every year, the spring migration brings us a colorful, musical gift from the tropics, although you wouldn’t guess this bird’s tropical origins from its name – Baltimore oriole. That flash of bright orange that catches your eye as a bird flies into a tree or moves through the foliage is probably a Baltimore oriole (Icterus galbula). The males are especially colorful in orange and black. Females and juvenal birds stand out less in yellow and brown. These birds got the name Baltimore almost 300 years ago (in 1731) when a naturalist named them for the orange and black colors of the Baltimore family of England, which founded the colony of Maryland in the 1600s. 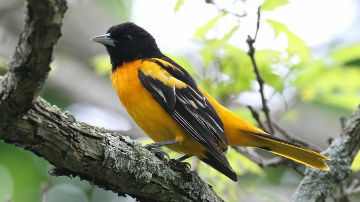 Not surprisingly, the Baltimore oriole is the state bird of Maryland, and let’s not forget the Baltimore Orioles baseball team. A beautiful orange and black butterfly, the Baltimore checkerspot (Euphydryas phaeton), is also named for the colors of the Baltimore family and is Maryland’s state butterfly. 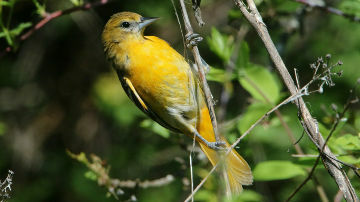 In the recent past, the bird had another name that doesn’t suggest its tropical origins – Northern oriole. You might still find it listed that way in some field guides and articles. Keep your eyes and ears open for Baltimore orioles along woodland edges, especially near water. Then look for their distinctive hanging nests, which are especially noticeable once the leaves are down. This summer, you might spot oriole nests in areas where gypsy moth caterpillars have eaten away much of the foliage. What to look for? If you see a brown ball that looks like a coconut hanging from the tip of a drooping tree branch, you’ve probably found an oriole’s nest. Elms, maples, willows, and apples are their trees of choice. The nest is a pouch that hangs down about 8 inches from forked twigs at the end of a thin branch. There it’s well concealed by leaves and difficult for tree-climbing predators such as squirrels or snakes to reach. The entrance hole is at the top. The female of an oriole pair chooses the nest site, gathers nesting materials such as old milkweed stems and grapevine bark (with a little help from the male), weaves the remarkable nest, and incubates 4-5 eggs. Nests often last throughout our harsh winter and into the spring (but are rarely reused), so if you find a nest you can plan to look for orioles in the vicinity next year. Why do orioles like to nest near water? Insects, of course. In the breeding season they need protein and eat mainly insects, including tent caterpillars, gypsy moth caterpillars, fall webworms, and other pests. Later on, during migration and in the tropics, they go for fruit and nectar. For this reason, you can sometimes attract orioles by putting out orange halves. By August our Baltimore orioles will start heading for their tropical wintering grounds in southern Mexico, Central America, and parts of Columbia, Venezuela, and Ecuador. There is some concern about loss of habitat for them in these areas as farmers cut down trees to switch from traditional shade-grown coffee crops to sun-grown coffee. Enjoy Baltimore orioles this summer, and then prolong the fun by searching for hanging oriole nests in the fall and winter.